Swimming is popular around the world for people of all ages and backgrounds. This is because it is a lot of fun, soothing on a hot day, and is a great form of exercise. A day at the beach or lake is a great way to spend time with loved ones. However, not everyone can handle going under the water in the same way. For some people, going underwater is painful if the water goes up their nose. This is why swimmer's nose clips are such an important investment. 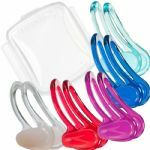 These swimming accessories will help make swimming that much more enjoyable because you will not have to worry about the pressure or pain that occurs when water is trapped in the nose. When shopping for swimmer's nose clips, always think about the size of the person's face and nose. The swimmer's nose clip should not be so tight that the circulation is cut off, because this will make wearing the item painful and will make swimming uncomfortable. A clip that is too loose may fall off when the user is underwater and will thus be useless. 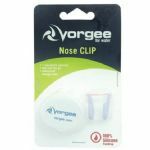 Swimmer's nose clips come in a variety of colors and designs. 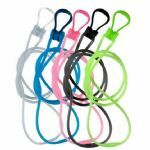 Shop around to see which color or pattern you want your clip to be. Have fun with this investment. You could buy different clips so that they match your swimwear or so they match your goggles or eyes. The right swimmer's nose clips will make a day at the beach far more enjoyable for people who have sensitive noses when it comes to going underwater. Get them for the whole family and think about each person's personality when doing so. This will take swimming to a whole new level!